River, Beach and Mountain you can do it all here! Enjoy a wonderful time in this small border town. Taste the traditional food in a nearby restaurant, bike in the brand new “Ecopista” or swim in the international waters of “Rio Minho”. São Pedro is a small and beautiful town where you can find all the commodities you need within walking distance, such as pubs, pharmacy, and bakery, ATM, post office, convenience store and more. Ideal for romantic getaways. Sit by the fire and feel the roaring of the wood in Wintertime or barbecue and sun bathe outside in Summer. Also fun-tastic for active couples looking for outdoor activities: fishing, biking, hiking, swimming and more. Saint Peter Cottage has been recently renovated to a high standard; here you will find all the commodities of a modern home in the safety of thick ancient stone walls. With bathtub and towel rail radiator. Iron wood stove located in the Living-room. In winter we provide a basket of wood for our guests. The cottage is ideally positioned to visit the area and very convenient for visiting Northern Spain as well. It is spotlessly clean and fitted with everything that you could want when you are self-catering. We enjoyed our stay. Cristina was a lovely, warm and friendly host. The house was tastefully decorated and spotless. We loved staying there! The town itself was small but there is enough to do and see in the surrounding area. 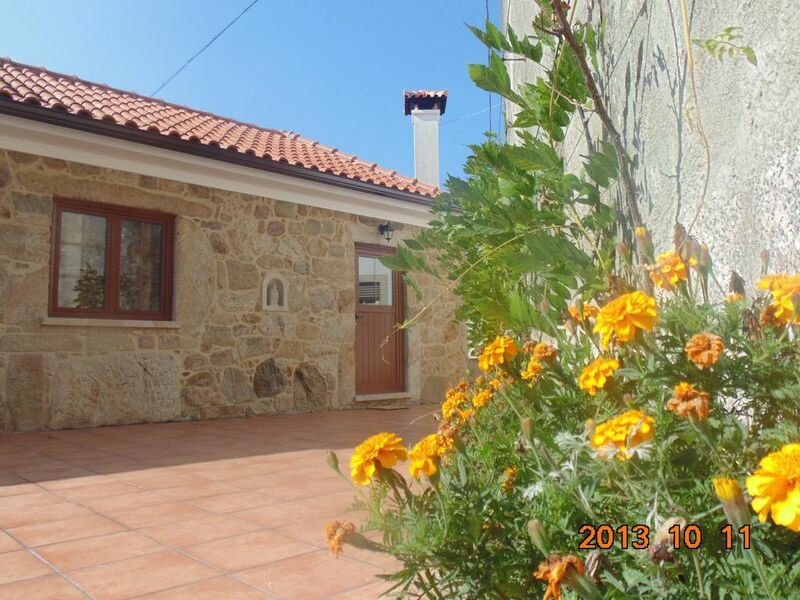 Lovely cottage with tiled garden area and large covered barbecue. Well equipped kitchen. Comfortable double bed. Christina was a fabulous host. She was very helpful with questions and responsive when we flagged concerns such as with the plumbing and electrical issues. Upon on arrival, she gave us fresh local eggs from her mother’s chickens and vinho from the Minho. We stayed for 8 nights and found the beds comfortable and the kitchen adequately stocked. Despite the sparse ammientes the towns of Valença and Vila Nova are close by with a car. The WiFi signal didn’t make it through the whole house, but it did work. Lovely cozy cottage. We loved our stay in St Peters Cottage. We had everything we could need in terms of the kitchen bathroom bedroom. The garden and outdoor kitchen were clean and safe for our little boy and as there was an electronic gate we were happy to leave him unsupervised in the garden. Cristina was a lovely host and was genuinely welcoming and kind. This cottage comes highly recommemded and we would come back again if we had the chance. St Peters Cottage was in a lovely village close to the river , and not too far away from some lovely beaches, easily accessible were different towns and places of interest also available was a bakery and convenience store, farmacia and a few cafe bars. Lots of walks by the river. It was easy to drive to Spain about 20 minutes. The property was well maintained and Cristina was a lovely host and very kind there was plenty of information in the cottage and Cristina was only a phone call away. It certainly fulfilled all our expectations and more.